iClassPro is happy to introduce our new “News & Announcements” feature to help you keep your customers in the know. 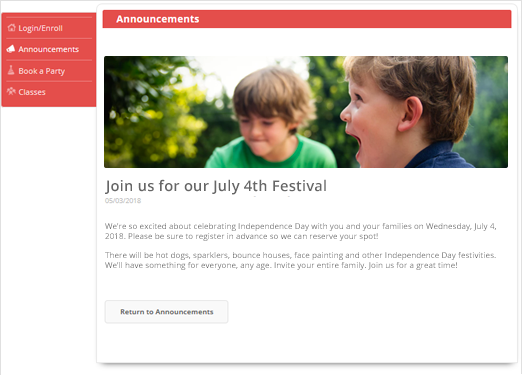 News & Announcements allows you to create blog-style posts that are displayed in the Parent Portal under the “Announcements” link in the navigation. These entries can help you relay vital information about closures, general notifications, registration deadlines, highlight staff members, and more! The possibilities are endless. Draft – a status for while you’re working on the announcement, but want to save progress. Published – allows you to publish the post as of a specific date. Scheduled – allows you to set a published day and time, as well as an expiration date and time for the announcement. Hidden – allows you to take down a published announcement. We also have options available for who can see the message. Each announcement can be made private (visible only after logging in through the portal) or public (visible to anyone visiting the page). The posts can even be restricted to one or more locations of the iClassPro account.